Summer is around and catching up pretty strong here in Bangalore. What best way to beat the heat than with cold kulfi that is delicious and refreshing. Here I present to you my variation of the kulfi. Boil milk in a thick bottom pan. On a medium flame cook the milk until it thickens (should take around 45 to 50 minutes). Keep stirring during the process. Once the milk is reduced to roughly ½ the quantity, add coffee, sugar and mix well. Switch off and let it cool. Once cooled pour it into a 4 inch square kulfi mould and put it in the freezer for about 6 to 8 hours. For the coffee-toffee sauce, heat a thick bottom pan, melt the butter. Add sugar and mix thoroughly. To this add water and let the sugar melt (remember to lower the heat and don't let the sugar caramelize). Once the sugar has melted, add salt and stir in the cream and mix nicely with a balloon whisk. Now add the coffee and let it boil for about a minute. Switch off and cool down the sauce. 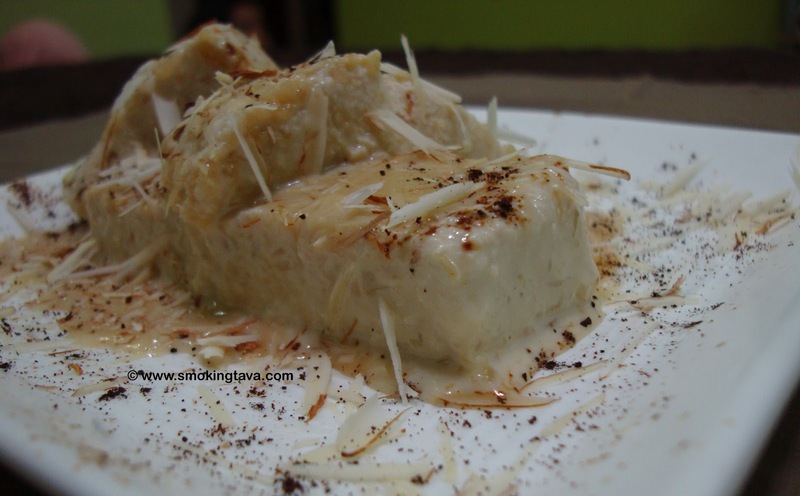 Cut thick slices of the kulfi and arrange them on a serving place, pour generous amount of the sauce. Sprinkle some shavings of badam. Enjoy delicious coffee infused kulfi with coffee-toffee sauce (Had a tough time plating, with the kulfi melting pretty fast in the heat).